I was planning on when will be the perfect time to start using it. You know what is the problem with planning for the “perfect” time? It never arrives. There is no perfect time. So today, I spontaneously did my first podcast with Danielle Devereux (follow her on Twitter). We talked about habits, productivity, scaling your business and work-life balance for an hour. It was so much fun but also insightful. I’ve never spoken to Danielle before today. The entire conversation was based on her reacting to some of the content that I was posting and me engaging back. That’s where the idea came from. She said we are very much in sync on our daily habits and rituals. I thought that would a cool thing to talk about live. So I simply suggested we do a podcast on the spot. She was cool enough to say yes. But this would’ve never happened if I hadn’t share content with my followers and if she wasn’t awesome enough to engage back (and then be even cooler by jumping on the podcast with me). It’s all about sharing and engaging authenticly. You know what would’ve happened if I kept on waiting for the perfect moment? I’d still be waiting. Remember one thing: Talking without action is useless BS. Take action. Be a practitioner. The time was good enough, the opportunity was unique – I took it. It was done. I’ll risk getting sued by Nike and tell you to ‘Just do it’!. I didn’t have 60 minutes to spare today. But for the sake of the adventure, experience and doing something new – I prioritized and found the time to do it. Serendipity plays a huge role in our life and we should always leave room for it. You have to plan ahead but also, make sure you are not missing out on the magic of living the moment and seizing opportunities. You never know what may be the hidden results for your actions, that’s why it is always so important to be present and in constant motion. Always do more, always bring value. Always be all in. Danielle actually took the time to summarize a little bit of what we talked about in a new Medium post. You should definitely take a look. We talk about habits, rituals, the difference between a freelance and a founder, scaling up your business and more. 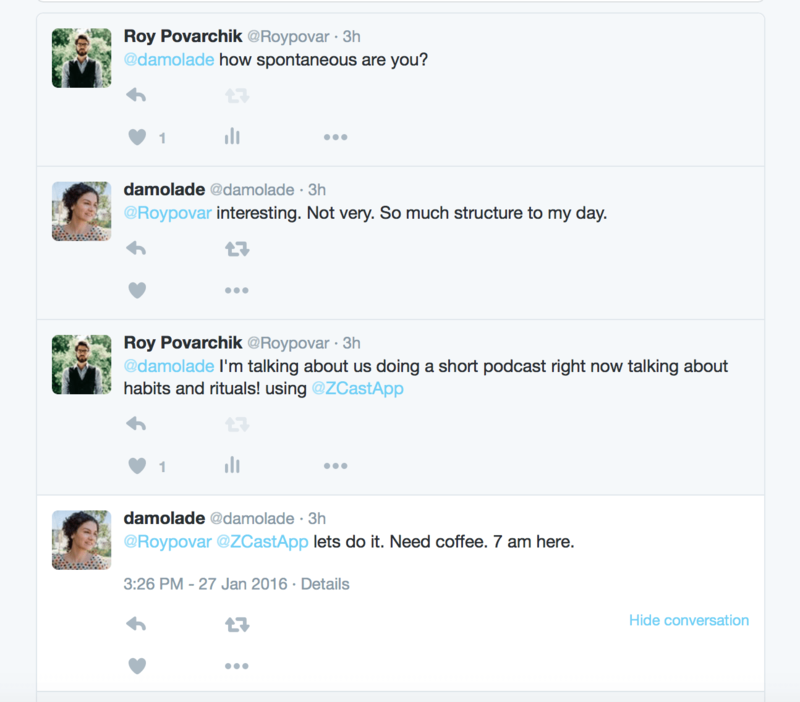 What’s next – I’m thinking of doing this spontaneous podcasts with my followers more often. What do you think? Would you tune in?